Sausalito's premier Real Estate Celebrity™, Steve Swepston, has been helping property owners and buyers in the Sausalito area for more than 20 years and has an intimate understanding of local real estate trends. Sausalito, California real estate is relatively strong primarily because of this town’s excellent location. Today, it is estimated that 7,500 people now live in this Bay area town but with only slight growth over the past seven years. Residents are split about 50/50 for male and female with the median age being 45. With the state of the economy, finding a Sausalito home foreclosure is much easier now than only two years ago. With this, the number of people that can now afford to buy a home in Sausalito has risen. For instance, homes in Sausalito, Ca, which includes most being single family properties and condominiums averages $1.1 to $1.2 million. Considering that only eight years prior the average sales price was $660,000, it is easy to see why the town’s population has not had a drastic increase. Again because of the number of homes in foreclosure, people interested in buying Sausalito real estate are now provided with a great opportunity that might otherwise never been possible. Interestingly, while there has been a significant increase in real estate value, the median income has only jumped from $88,000 in 2000 to $105,000 today. Another possibility that some people consider is finding a floating home for sale in Sausalito, Ca. A "floating home", means a houseboat, with many being gorgeous and roomy. In fact, some houseboats are more than 1,200 square feet in size, have two or three bedrooms, one or two bathrooms, full functioning kitchens, and everything to feel comfortable and at home. Another type of property includes Sausalito vacation rentals. In this case, some people in a good financial position to own a regular home or vacation home will stay in the city for work or live in an entirely different state, using the vacation home as a place to go on the weekends or for holidays and vacations. Depending on the situation, rental real estate is often rented out to tourists during summer months, which allows the owner to build equity while having the mortgage covered each month throughout the year. The same is true in the situation of a houseboat rental in Sausalito. Some of the houseboats in this area of California are owned specifically for renting out to tourists. Considering that a 1,000 square foot, two bedroom, one bathroom houseboat rents for around $300 a day, $1,600 a week, or $3,500 a month, this type of deal makes perfect sense as real estate investment. Of course, the owner could then retire in Sausalito, enjoying the floating home during the "golden years." Anyone interested in looking at a Sausalito, California home for sale needs to be prepared to do research, work with a reputable real estate agent, and look at several properties. Today, there is opportunity to purchase a foreclosed home that needs some repair or go with a traditional sale of a single family home, condominium, or houseboat. The price that someone would expect to pay would be $1.4 million for a detached home, $1.1 million for a single family dwelling, $945,000 for a townhouse or condominium, and as much as $35,000 for a mobile home. Obviously, the cost to own real estate in Sausalito is less than other California cities but still strong. Then, for the amazing Bay area view, excellent services and businesses, and hospitable people, real estate in this area is something people should seriously ponder. 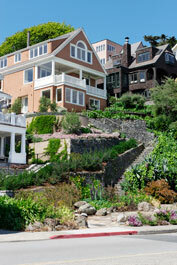 Sign up for free and start taking advantage of Sausalito.com's great real estate tools.